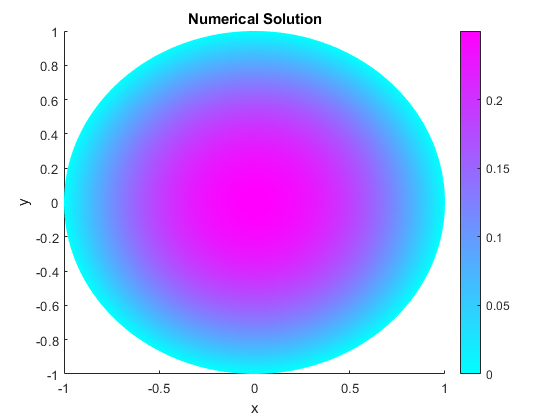 This example shows how to numerically solve a Poisson's equation, compare the numerical solution with the exact solution, and refine the mesh until the solutions are close. The example uses the solvepde function. 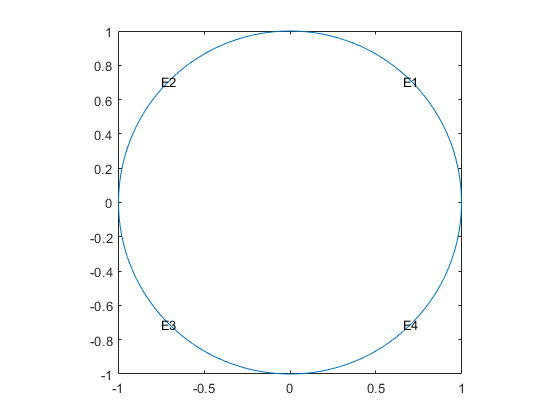 For the PDE Modeler app solution, see Poisson's Equation on Unit Disk: PDE Modeler App. Because the app and the programmatic workflow use different meshers, they yield slightly different results. For most PDEs, the exact solution is not known. 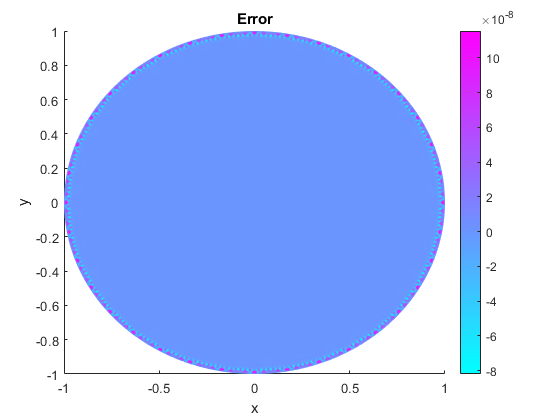 However, the Poisson's equation on a unit disk has a known, exact solution that you can use to see how the error decreases as you refine the mesh. Create the PDE model and include the geometry. Specify zero Dirichlet boundary conditions on all edges. Create a mesh with target maximum element size 0.1. Solve the PDE and plot the solution. Compare this result with the exact analytical solution and plot the error. Solve the equation while refining the mesh in each iteration and comparing the result with the exact solution. Each refinement halves the Hmax value. Refine the mesh until the infinity norm of the error vector is less than 5⋅10-7. 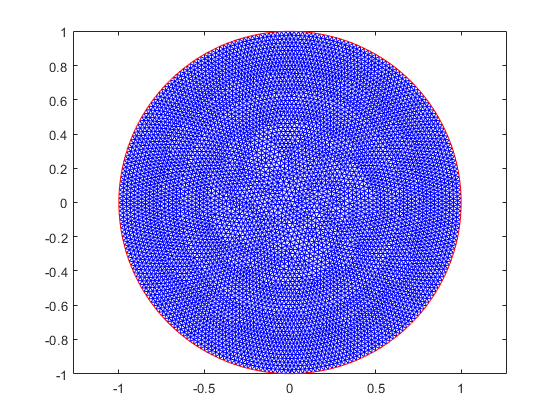 Plot the infinity norm of the error vector for each iteration. 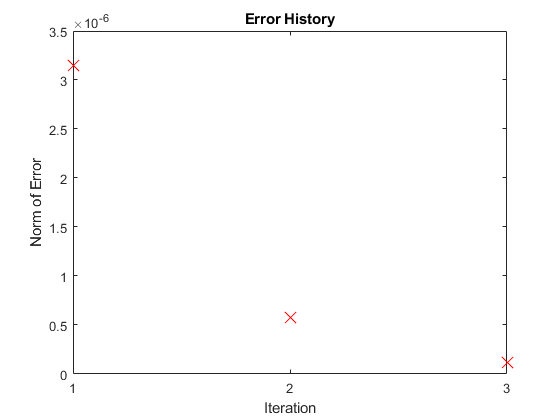 The value of the error decreases in each iteration. 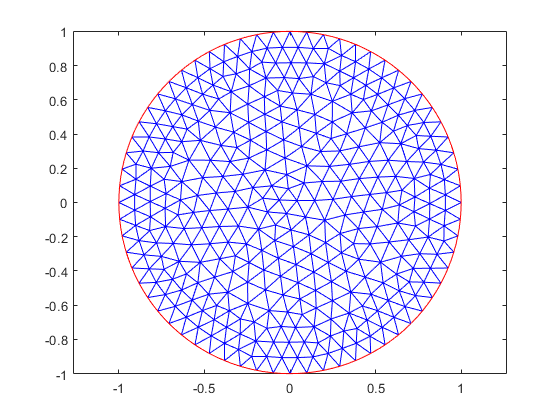 Plot the final mesh and its corresponding solution. Compare the result with the exact analytical solution and plot the error.